Product #60575 | SKU CI3094 | 0.0 (no ratings yet) Thanks for your rating! The Cinegears 4 x 4 All-Wheel Drive X Gimbal Car can capture professional, gimbal-stabilised footage. Along with four-wheel drive, a 23" (58.42cm) wheel spread, and a maximum payload up to 30kg, the X gimbal car utilises electric steering and braking via its 2.4 GHz controller to capture smooth shots in challenging locations. 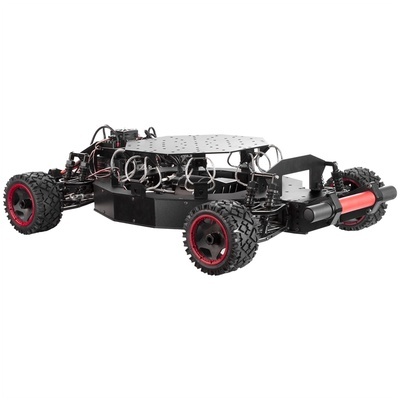 The car utilises four treaded tracks to navigate rough terrain, and the 3-point suspension system helps disperse weight and keep your payload steady at a top speed of 50 mph. The X gimbal car includes a built-in DJI Ronin gimbal mount adapter to combine the flexibility of a professional gimbal with the sturdiness of the aluminium body. A separately available MōVI adapter plate can be purchased to utilise a MōVI gimbal and its accessories. The car is powered with the two included 14.8V, 77Wh 4S batteries, and using separately available dual 4S Li-ion batteries or batteries in 6S or 8S configurations with up to 28V output, which can provide up to 24 hours of battery life. The brushless 960Kv motor and transmission are rated waterproof and dustproof, and a top cheese plate is provided to attach additional accessories to your gimbal.